Aside from starting the PBA Governors' Cup on the right foot by beating the GlobalPort Batang Pier last Tuesday, this news about the Barangay Ginebra San Miguel's top player will surely add up to their loyal fans' happiness. 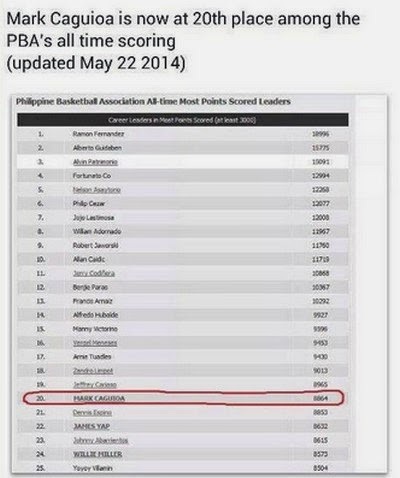 BGSM skipper Mark 'The Spark' Caguioa moved up in the PBA's all time scoring Player Rankings as of as of May 22, 2014. He is now in the 20th place behind the team's new coach "The Jet" Jeffrey Cariaso and ahead of former Sta. Lucia big man Dennis Espino. Mark continues to make his game count when BGSM takes on the Meralco Bolts this coming weekend May 24 (Saturday) at the MOA ARENA.